Welcome to the Week 6 RB Rankings! Yikes. It’s sort of ugly out there for running backs. The Saints took two of the top 12 guys with them on their bye week. We’re missing several more to injury and the NFL is throwing the ball a ton. It’s tough sledding if you are searching for options. I’ll be working on the backs more than any other position between now and the update and I’ll try to find better answers with the guys between 20 and 50 in these rankings. For DFF this week, I want to pay up for Gurley if I can find a budgetary path to him. I’m also liking Melvin Gordon, James Conner, Mixon, and TJ Yeldon to name a few. Bilal Powell and Tevin Coleman look like potential money-savers depending on how the injury situations play out on their teams. I’ll get deep into this stuff on Saturday’s DFF podcast. I’ll be back in a bit with the TEs. 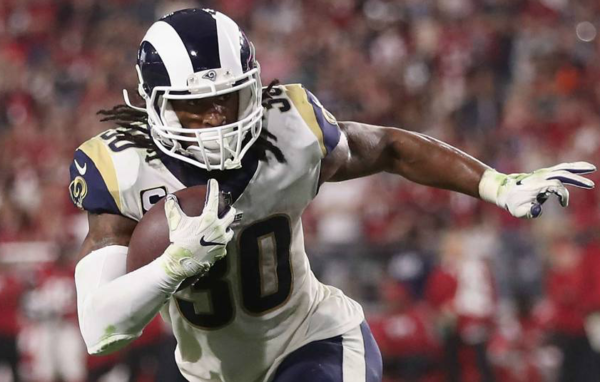 1 Todd Gurley II LAR 10.000 LAR@DEN 10/14/2018 04:05PM ET Great matchup. Gurley should get a lot of carries this week, not to mention touchdowns. 2 Melvin Gordon III LAC 8.200 LAC@CLE 10/14/2018 01:00PM ET He should get loads of work. This offense is perfect for him in terms of getting pass game work. He’s impervious to game flow it seems. 3 Ezekiel Elliott DAL 7.000 JAX@DAL 10/14/2018 04:25PM ET Tough matchup, but what do you think their strategy will be? Even Jason Garrett can figure this one out. Lot’s of Zeke this week and he’s probably one of their best options through the air too. 4 Christian McCaffrey CAR 8.300 CAR@WAS 10/14/2018 01:00PM ET I’m mildly concerned that his targets have dropped over the last two weeks, but it’s hard to complain much since they’ve kept him hugely involved on the ground. I’m thinking they’ll get him more involved as a receiver this week, but it’s something to watch for those in full PPR leagues. 5 James Conner PIT 7.700 PIT@CIN 10/14/2018 01:00PM ET He was awesome last week and no reason to shy away from him here. 6 Joe Mixon CIN 7.500 PIT@CIN 10/14/2018 01:00PM ET Should be ready to go after playing a big role in his first week back. Solid matchup as he’s a very diverse back. Game flow means little for him this week. 7 Kareem Hunt KC 6.600 KC@NE 10/14/2018 08:20PM ET Plenty of ways for him to help you this week. The carries will be there and plenty of TD potential. 8 David Johnson ARI 5.900 ARI@MIN 10/14/2018 01:00PM ET People will run away from him in this bad matchup, but if you really think about it, it could help him get more receptions in the passing game. Not sure about using him in cash, but his price tag is appealing in GPPs. 9 T.J. Yeldon JAX 6.400 JAX@DAL 10/14/2018 04:25PM ET He’ll be the guy this week with Fournette and Grant out and Jamaal Charles only in town for 48 hours at this point. 10 Sony Michel NE 5.800 KC@NE 10/14/2018 08:20PM ET Has a sore knee so keep tabs on his status but he’s in a great spot this week if he plays. 11 James White NE 6.900 KC@NE 10/14/2018 08:20PM ET Gets a nice bump in PPR and may be a better play than Sony depending on Sony’s health. 12 Marshawn Lynch OAK 5.300 SEA@OAK 10/14/2018 01:00PM ET It’s a walk down narrative street as BEAST-MODE plays his old team. It’s hard to see him not playing well here and Gruden loves this stuff, so who knows, he might just give him an old school Lynch workload. 13 Jordan Howard CHI 6.500 CHI@MIA 10/14/2018 01:00PM ET I expect him to do his usual thing. The Tarik Cohen thing was not a one-time thing, but was a game-plan-specific thing. Howard’s still the guy who will carry the mail. I’d also look for more Cohen/Howard tandem formations. Both are crucial elements in this offense and they need to get Cohen more receptions in space. It’s easier to do when he plays more snaps. 14 Tevin Coleman ATL 5.400 TB@ATL 10/14/2018 01:00PM ET Should be in the lead role again this week with Freeman banged up. Nothing set in stone yet, but that’s how things are shaping up. 15 LeSean McCoy BUF 5.500 BUF@HOU 10/14/2018 01:00PM ET They finally decided to play their best player last week and low and behold, he played well. Should be more of the same this week. Shady wants to run his way right out of town in a trade. He might just do it too. 16 Dalvin Cook MIN 5.700 ARI@MIN 10/14/2018 01:00PM ET Sounds like he’s back, which is huge for those who took the plunge on him. The matchup is a solid one. 18 Carlos Hyde CLE 4.900 LAC@CLE 10/14/2018 01:00PM ET Only played 35% of the snaps last week so we have some issues here, but he did manage 17 carries so he’s still playable. 20 Nyheim Hines IND 5.100 IND@NYJ 10/14/2018 01:00PM ET He’s the most bankable back in Indy as I’ve been saying all year. This week will be a test as Marlon Mack should return and make some kind of an impact beyond what Jordan Wilkins has been able to make. 21 Tarik Cohen CHI 4.600 CHI@MIA 10/14/2018 01:00PM ET I am leaning in on him on a week where there is a lot of weak RB2 action. It’s a bit risky, but then again, so are most of these guys outside of the top 14-15 spots. 26 Chris Thompson WAS 6.100 CAR@WAS 10/14/2018 01:00PM ET Could do some damage this week but needs the big play to really pay off. 27 Bilal Powell NYJ 4.500 IND@NYJ 10/14/2018 01:00PM ET He’s a tremendous option if Crowell misses Week 6. The Jets have no other backs they can trust. It will be the Bilal Show if it happens. 28 Isaiah Crowell NYJ 5.000 IND@NYJ 10/14/2018 01:00PM ET He’s got an ankle sprain that could keep him out this week. We’ll know more after Friday practice. For now, I’m treating him like he’ll play. ***UPDATE*** I went back and watched the Jets game again—looking for Crowell’s injury (which was not easy to spot—no big harsh turn) and from what I can figure, he came back in after the play and had a few more touches. This may be less than advertised and Crowell could get more work than the media is speculating. Keep tabs on this tomorrow. He may be a decent flex play. 34 Alfred Morris SF 4.700 SF@GB 10/15/2018 08:15PM ET He’s a flex or an RB2 and it all delends on Breida, who is a game time decision. 36 Marlon Mack IND 3.800 IND@NYJ 10/14/2018 01:00PM ET A player to watch closely this week, but he’s impossible to trust at this point. He’s a risky flex with upside, but he could play his way into the RB2 discussion if he plays really well. 46 Kyle Juszczyk SF 3.800 SF@GB 10/15/2018 08:15PM ET Should catch some balls assuming Breida sits. 51 Matt Breida SF 5.500 SF@GB 10/15/2018 08:15PM ET Doubtful (ankle) ***UPDATE*** Game time decision, which is not all that helpful unless you have a plan B like Alf Morris laying around. 60 Jamaal Charles JAX 0 JAX@DAL 10/14/2018 04:25PM ET Should play some. 62 Trenton Cannon NYJ 3.000 IND@NYJ 10/14/2018 01:00PM ET Could play a small role of Crowell sits out. 64 Devonta Freeman ATL 6.000 TB@ATL 10/14/2018 01:00PM ET OUT with a foot injury. I’ll upgrade him if anything changes, but no practice at all so far this week. 69 Saquon Barkley NYG 7.400 PHI@NYG 10/11/2018 08:20PM ET Tough matchup and you’d HAVE to think the Giants will find some OTHER ways to use him against a defensive front as nasty as this one. We’ll see. If they don’t get a little creative here, it’s another bad sign. Volume alone make Saquon a safe RB1 play.